Disney has released a great teaser poster for Sam Raimi‘s Oz The Great and Powerful. 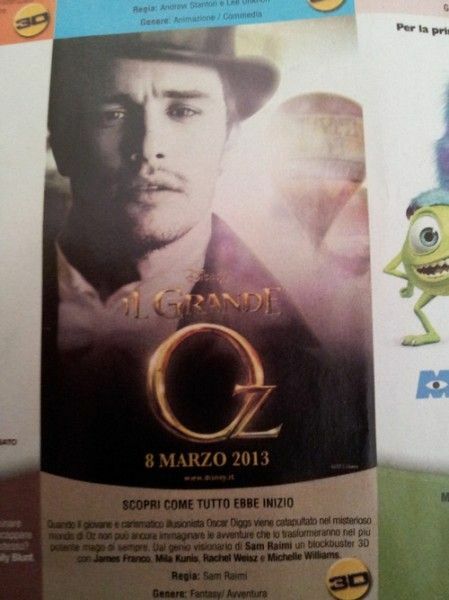 The pic serves as a prequel to the classic fantasy The Wizard of Oz and stars James Franco as the eponymous wizard. The story centers on Franco’s small-time circus magician with dubious ethics who finds himself transported to Oz and drawn into a battle between the three witches Theodora (Mila Kunis), Evanora (Rachel Weisz) and Glinda (Michelle Williams). The film also stars Zach Braff as Franco’s circus assistant, and Braff will also lend his vocal talents to one of the CGI creatures in the story — Finley, the winged monkey. With Disney promoting the film at Comic-Con next week, I’m sure this is just the tip of the iceberg in terms of marketing materials. Hit the jump to check out the poster. Oz The Great and Powerful opens March 8, 2013.